The Austrian company HERZ is one of the leading producers of innovative and environmentally-friendly heating systems and produces equipment for the entire heating and installation industry. HERZ Energietechnik in cooperation with HERZ Armaturen GmbH ,with branches and partners in all European countries are in a position to give the optimum support to the customers at any time. Their current and potential clients from Bulgaria and the region will have the chance to arrange meetings during the 3 days of the Energy Efficiency & Renewable Energy exhibition which will take place in Sofia , 27-29 March. HERZ is in a long term collaboration with the event and will join the traditional Austrian Pavilion. Dear Mr. Voynoski, Herz offers various range of products: Boilers for logwood, pellet boilers, Storage and transport systems, Heat pumps, Buffer & hot water tanks, Solar technology and Controllers. Please tell us more details about your products and what makes them preferred by the clients? 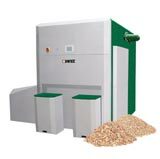 HERZ pelletfire and the pellet boiler HERZ firematic are two of our compact and efficient solutions. The multifunctional HERZ pelletfire is a perfectly paired combination of a log and wood pellet boiler. Due to the separate combustion chambers, the operation can be switched easily between logs and wood pellets. If the buffer or heating circuits require heat after burning of all logs, the operation is automatically continued with wood pellets. Thanks to the in-built Lambda probe, which continuously monitors the flue gas values, the boiler reacts to changes in fuel quality ensuring optimum combustion and extremely low emission values. The heat exchanger surfaces are automatically cleaned via the integrated turbulators, even during heating operation, eliminating manual cleaning. A consistently high level of efficiency thanks to cleaned heat exchanger surfaces enables low fuel consumption. The very compact design of the HERZ firematic series also continues to a power output till 499 kW, making the system to an optimal solution even in limited space situations. Even in existing boiler rooms with limited space, it is now possible to realize biomass projects! The boiler consists of 2 modules, the combustion chamber and heat exchanger module. This makes installations and assembly quick & easy. The combustion chamber and heat exchanger are automatically cleaned and kept clean without manual effort. For convenience, the automatic ash removal moves the combustion and fly ash in hoppers or, if required, into a larger external ash container. What of your product line will you present in Sofia? After intensive development work, the first HERZ pellet boiler with condensing technology is presented. The high-end combustion technology and the premium components results in a high efficient pellet boiler with the lowest dust-emissions. The water vapor which is contained in the flue gas is cooled down so far that liquid condensate is formed. In condensing technology, the cooling of the exhaust gases (condensation, i.e. liquefaction) releases additional heat and uses them for heating purposes, resulting in fuel savings of up to 20% compared with high-quality classic pellet boilers. This compact boiler is the ideal solution for new buildings as well as for modernization. The heat distribution can be done via a low temperature system (underfloor heating) or a high tempereture system (radiators). 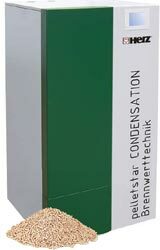 Depending on requirement the pellestar CONDENSATION delivers the correct temperature also without buffer tank.